Hilarious and Macabre, Fans of Ron Gilbert, and adventure games will like it, Fans of both will love it! Welcome to The Cave, Ron (of Monkey Island fame) Gilbert’s latest creation: A whimsical, hilarious and often morbid trek through a sentient talking cave. If you’re familiar with Ron Gilbert’s body of work, you’re already going to know if his quirky sense of humor clicks with you, and if it does, then The Cave will likely be up your alley. It’s a highly entertaining game, despite its flaws. The game begins in an unorthodox way… as the opening cinematic plays, you soon realize that the game has already started and it’s up to you to select from the game’s seven playable characters, each of whom have a unique special ability and their own goal within the cave. 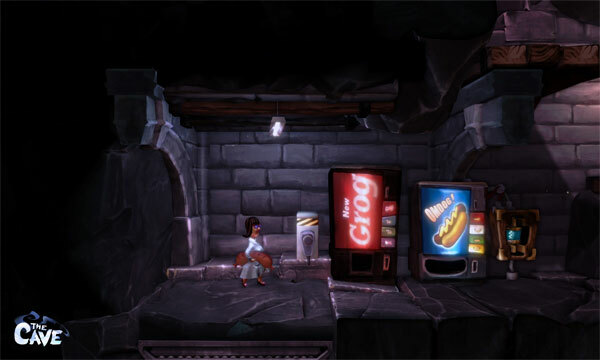 Presented in the format of a 2D platform game, at its heart The Cave is really a simplistic adventure game. 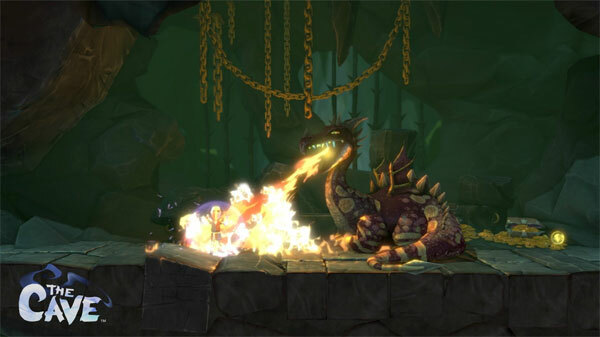 Similar to the Blizzard classic The Lost Vikings, you travel with your three characters throughout The Cave, solving puzzles by interacting with the environment—using your characters’ special skills and using the various items you find laying about. It’s a good thing The Cave isn’t a traditional 2D platformer, as the slightly unpolished controls would likely be a real hindrance to the game play. As it is though, they don’t really hold you back, just make it seem like they didn’t quite have time to get the controls just right before shipping. There is also the occasional environmental bug. I was able to get my characters stuck in several places throughout the game (though switching to another character and back usually seemed to make the character warp out of their stuck position)… but at one point, I tried climbing a rope ladder as high as I could, and it took the character I was controlling into the ceiling… and then suddenly warped my entire party to a place much further on in the cave, skipping a huge section of playable area. Your first task is to choose three of the characters to travel with through the cave, which is unfortunately one of my minor gripes with the game. It isn’t really explained very clearly, so you might pick your first and possibly second character before you realize what’s happening. In concept, throwing the player right into the game is great from a story-telling aspect, but as simple as the controls are, not getting a primer on those controls required me to pop into the settings menu and take a look before I understood what was going on. That said, the character only mechanic makes sense—it would be unwieldy to control seven characters at a time, but due to the nature of the game’s setup, you’ll end up replaying some sections and puzzles over on each play-through, and that can get a little tiresome. I would’ve much preferred a unique experience based on the characters you’ve selected. The puzzles aren’t terribly difficult, but they provide an adequate challenge. If you’re an old-school adventure gamer, you’ll probably figure most of them out in short order—and it really is worth re-playing some of the puzzles to experience each character’s deepest, darkest desire. And make no mistake, for the most part each of the characters’ motivations and goals in their individual sections of the game are deceptive at best, and downright sinister at their worst. In some cases, you won’t even realize the sinister implications of your character’s selfish desires until it’s too late, and even if you see the mayhem coming, you can’t stop it if you want to proceed. All to say that if you have trouble finding humor in the macabre, then I would definitely suggest you give The Cave a pass. All in all, The Cave will be an entertaining diversion for fans of Ron Gilbert and / or adventure games; I just wish a little more time had been spent polishing the minor defects and some more thought had gone into progression through the game to avoid so much replay. As it sits (since it requires at least three play-throughs to see all the characters’ stories), your best bet is to walk away and set it to the side for a while after completing the game. Then, return to it when the significant portions of the game you’ll have to replay aren’t still fresh in your mind. Want to know what our review scores mean? Read about it here.